The conjuctiva is the clear mucous membrane that covers the sclera (white part of the eye) and lines the inside of the eyelids. This image of the human eye shows clearly the blood vessels of the conjuctiva. Trachoma is a contagious, chronic inflammation of the eye's mucous membranes (Frey 2002). Trachoma, also known as granular conjunctivitis, is an infectious eye disease caused by the bacteria Chlamydia trachomatis and characterized by inflammation of the conjunctiva, sensitivity to light, and, if untreated, scarring and possibly partial or total blindness. Highly contagious in the early states, blindness results when there are recurrent, untreated infections (Frey 2002). Trachoma (from the Ancient Greek for "rough eye") is the second leading cause of blindness in the world, and the leading cause of infectious blindness (GNNTD 2006). About six of the twenty million cases of blindness in the world tied to this disease, as well as impaired vision in about 140 million people (Breslow 2002). About 84 million people suffer from active infection (GNNTD 2006). As an infectious disease, trachoma is preventable and is rare in industrialized nations with effective fly control measures and good hygiene (Breslow 2002). It is most common in poor, rural areas in hot dry countries, such as in some nations in the Middle East and in arid regions of North Africa, Pakistan, India, and inland Australia (Breslow 2002). In the United States, it is most prevalent in parts of Appalachia and among certain Native Americans (Frey 2002). As an infection limited to humans, trachoma offers the possibility of preventing transmission, and efforts are being made for its complete eradication. C. trachomatis was identified in 1907, and was the first chlamydial agent discovered in humans (Budai 2007). Many, but not all, C. trachomatis strains have an extrachromosomal plasmid (Alexander and Ison 2007). C. trachomatis has only been found living inside the cells of humans. It can be transmitted by insects, or by direct contact with eye, nose, and throat secretions from affected individuals (such as hand-to-eye contact), or contact with fomites (inanimate objects), such as towels and/or washcloths, that have had similar contact with these secretions. It is commonly transmitted by flies that crawl into the eyes of young children (Breslow 2002). Blinding endemic trachoma occurs in areas with poor personal and family hygiene. Many factors are indirectly linked to the presence of trachoma including lack of water, absence of latrines or toilets, poverty in general, flies, close proximity to cattle, crowding, and so forth (Taylor 2008; Wright et al. 2008). A common pathway seems to be the presence of dirty faces in children that facilitates the frequent exchange of infected ocular discharge from one child’s face to another. Most transmission of trachoma occurs within the family (Taylor 2008). The bacteria has an incubation period of 5 to 12 days, after which the affected individual experiences symptoms of conjunctivitis. Conjunctivitis is an inflammation of the conjunctiva—the clear membrane that covers the sclera (white part of the eye) and lines the inside of the eyelids. The conjuctiva is made of lymphoid tissue. Blinding endemic trachoma results from multiple episodes of reinfection that maintains the intense inflammation in the conjunctiva. Without reinfection, the inflammation will gradually subside (Taylor 2008). The conjunctival inflammation is called active trachoma, which is characterized by white lumps in the undersurface of the upper eye lid (conjunctival follicles or lymphoid germinal centers) and by non-specific inflammation and thickening often associated with papillae. 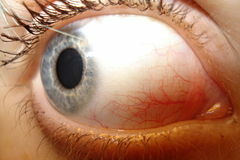 Follicles (small sacs) may also appear at the junction of the cornea and the sclera (limbal follicles). Active trachoma will often be irritating and have a watery discharge. Bacterial secondary infection may occur and cause a purulent discharge. Active trachoma usually is seen in children, especially pre-school children. The later structural changes of trachoma are referred to as cicatricial trachoma. These include scarring in the eye lid (tarsal conjunctiva) that leads to distortion of the eye lid with buckling of the lid (tarsus) so the lashes rub on the eye (trichiasis). These lashes will lead to corneal opacities and scarring and then to blindness. In addition, blood vessels and scar tissue can invade the upper cornea (pannus). Resolved limbal follicles may leave small gaps in pannus (Herbert’s Pits). Trachomatous inflammation, follicular (TF). Five or more follicles of greater than 0.5 millimeters on the upper tarsal conjunctiva. Trachomatous inflammation, intense (TI). Papillary hypertrophy and inflammatory thickening of the upper tarsal conjunctiva obscuring more than half the deep tarsal vessels. Trachomatous trichiasis (TT). At least one ingrown eyelash touching the globe, or evidence of epilation (eyelash removal). Corneal opacity (CO). Corneal opacity blurring part of the pupil margin. Further ear, nose, and throat complications. Diagnosis involves an eye examination combined with the patient's history, including whether the patient lives or has traveled in areas with high rates of trachoma. Observation is made for the presence of follicles or scarring, and a small sample of cells from the conjunctiva can be taken for an examination, using the Giemsa staining procedure, for a confirmation of the diagnosis (Frey 2002). Treatment involves use of antibiotics for four to six weeks, with tetracycline, erythromycin, or sulfonamides, and may include both antibiotic ointment applied directly to the eyes with oral medication (Frey 2002). An alternative is a single-dose treatment with azithromycin (Frey 2002). WHO recommends a single oral dose of 20mg/kg azithromycin or topical tetracycline (one percent eye ointment twice a day for six weeks). Azithrtomycin is preferred because it is used as a single oral dose. Although it is expensive, it is generally used as part of the international donation program organized by Pfizer through the International Trachoma Initiative (Mariotti 2004). Azithromycin can be used in children from the age of six months and in pregnancy (Taylor 2008). Those with complications may need surgery. For individuals with trichiasis, a bilamellar tarsal rotation procedure is warranted to direct the lashes away from the globe (Reacher et al. 1993). Early intervention is beneficial as the rate of recurrence is higher in more advanced disease (Burton et al. 2005). If not treated properly with oral antibiotics, the symptoms may escalate and cause blindness. Untreated, repeated trachoma infections result in entropion—a painful form of permanent blindness when the eyelids turn inward, causing the eyelashes to scratch the cornea. Children are the most susceptible to infection, but the blinding effects, which are the result of ulceration and consequent scarring of the cornea, are often not felt until adulthood. If treated promptly and properly, the prognosis is excellent for full recovery (Frey 2002). Although there are vaccines against trachoma, they only offer temporary protection, and there is no permanent immunization (Frey 2002). Prevention is tied to good hygiene and public health measures (Frey 2002). Although trachoma was eliminated from much of the developed world in the last century, this disease persists in many parts of the developing world particularly in communities without adequate access to water and sanitation. In many of these communities, women are three times more likely than men to be blinded by the disease. Without intervention, trachoma keeps families shackled within a cycle of poverty, as the disease and its long-term effects are passed from one generation to the next. WHO Guidelines recommend that a region should receive community-based, mass antibiotic treatment when the prevalence of active trachoma among one to nine year old children is greater than 10 percent (Solomon et al. 2006). Subsequent annual treatment should be administered for three years, at which time the prevalence should be reassessed. Annual treatment should continue until the prevalence drops below five percent. At lower prevalences, antibiotic treatment should be family-based. Children with grossly visible nasal discharge, ocular discharge, or flies on their faces are at least twice as likely to have active trachoma as children with clean faces (Taylor 2008). Intensive community-based health education programs to promote face-washing can significantly reduce the prevalence of active trachoma, especially intense trachoma (TI). Modifications in water use, fly control, latrine use, health education and proximity to domesticated animals have all been proposed to reduce transmission of C. trachomatis. These changes pose numerous challenges for implementation. It seems likely that these environmental changes ultimately impact on the transmission of ocular infection by means of lack of facial cleanliness (Taylor 2008). Particular attention is required for environmental factors that limit clean faces. Trachoma is one of the earliest recorded eye afflictions, having been identified in Egypt as early as 15 B.C.E. (Taylor 2008). Its presence was also recorded in ancient China and Mesopotamia. Trachoma became a problem as people moved in crowded settlements or towns where hygiene was poor. It became a particular problem in Europe in the nineteenth century. After the Egyptian Campaign (1798–1802) and the Napoleonic Wars (1798–1815), trachoma was rampant in the army barracks of Europe and spread to those living in towns as troops returned home. Stringent control measures were introduced and by the early twentieth century, trachoma was essentially controlled in Europe, although cases were reported up until the 1950s (Taylor 2008). Trachoma is rare in the United States. In 1913, President Woodrow Wilson signed an act designating funds for the eradication of the disease (Allen and Semba 2002). The people that went through Ellis Island had to be checked for trachoma. By the late 1930s, a number of ophthalmologists reported success in treating trachoma with sulfonamide antibiotics (Thygeson 1939). Today, according to the Centers for Disease Control, trachoma as a cause of blindness has been eliminated from the United States, with the last cases of such blindness found in Appalachia and among the American Indian populations (CDC 2005). Although by the 1950s, trachoma had virtually disappeared from the industrialized world, thanks to improved sanitation and overall living conditions, it continues to plague the developing world. Today, most victims of trachoma live in underdeveloped and poverty-stricken countries in Africa, the Middle East, and Asia, and in some parts of Latin America and Australia. Alexander, S., and C.A. Ison. 2007. Is new variant Chlamydia trachomatis present in England and Wales? Sexually Transmitted Infections 84: 29. PMID 17855488. Retrieved August 8, 2008. Allen, S.K., and R.D. Semba. 2002. The trachoma menace in the United States, 1897-1960. Surv Ophthalmol 47(5): 500–9. PMID 12431697. Retrieved August 8, 2008. Budai, I. 2007. Chlamydia trachomatis: Milestones in clinical and microbiological diagnostics in the last hundred years: A review. Acta microbiologica et immunologica Hungarica 54(1): 5–22. PMID 17523388. Retrieved August 8, 2008. Burton, M. J., F. Kinteh, O. Jallow, et al. 2005. A randomised controlled trial of azithromycin following surgery for trachomatous trichiasis in the Gambia. Br J Ophthalmol 89(10): 1282–8. PMID 16170117. Centers for Disease Control and Prevention (CDC). 2005. Trachoma. Centers for Disease Control and Prevention. Retrieved August 8, 2008. Frey, R.J. 2002. Trachoma. In J.L. Longe (ed. ), The Gale Encyclopedia of Medicine, 2nd edition. Detroit: Gale Group/Thomson Learning. ISBN 0787654949. Global Network for Neglected Tropical Diseases (GNNTD). 2006. About neglected tropical diseases (NTDs). Global Network for Neglected Tropical Diseases. Retrieved August 8, 2008. Mariotti, S.P. 2004. New steps toward eliminating blinding trachoma. N. Engl. J. Med. 351(19): 2004–7. PMID 15525727. Retrieved August 8, 2008. Reacher, M., A. Foster, and J. Huber. 1993. Trichiasis Surgery for Trachoma. The Bilamellar Tarsal Rotation Procedure. Geneva: World Health Organization. WHO/PBL/93.29. Solomon, A. W., M. Zondervan, H. Kuper, et al. 2006. Trachoma control: A guide for programme managers. World Health Organization. Retrieved August 8, 2008. Taylor, H. 2008. Trachoma: A Blinding Scourge from the Bronze Age to the Twenty-first Century. Centre for Eye Research Australia. ISBN 0975769596. Thygeson, P. 1939. The treatment of trachoma with sulfanilamide: A report of 28 cases. Trans Am Ophthalmol Soc 37: 395–403. PMID 16693194. Retrieved August 8, 2008. Thylefors, B., C.R. Dawson, B.R. Jones, S.K. West, and H.R. Taylor. 1987. A simple system for the assessment of trachoma and its complications. Bull. World Health Organ. 65(4): 477–83. PMID 3500800. Retrieved August 8, 2008. Wright, H.R., A. Turner, and H.R. Taylor. 2008. Trachoma. Lancet 371(9628): 1945–54. PMID 18539226. Retrieved August 8, 2008. This page was last modified on 12 August 2008, at 19:41.